I love citrus fruit, I think it all started when we were kids and we would go visit my grandmother and grandfather in Jenine. My grandparents had a two-story house and we usually stayed in the second floor when we visited. My favorite part of the house was the balcony, it provided a breath-taking view of orange orchards that stretched as far as the eye can see. It was sheer joy to wake up in the morning, open the window and allow the first rays of sunlight to wash over you carrying with them a smell I will never forget, the smell of orange blossoms.In early morning and late afternoon the breeze carried over the scent of those pearly white blossoms and whenever I smell it now, it brings back fond memories of days spent playing between the trees, climbing, looking for bird nests and hours spent in treasure hunts in a sea of leaves, trees and oranges. When linda posted about January being #citrus love month, I couldn’t wait to participate. This time of year every where you look there are hues of orange and yellow, grocery stores and farmers markets with displays full of the colors of the sunset. Oranges of every shape and kind, lemons, pummelo and tangerines. I happened to have a couple of avocados to use and was looking for inspiration when I came across this salad recipe and couldn’t wait to try it. I stuck to the recipe except for doubling the amount and I omitting basil from the dressing because I didn’t have any. The result was as refreshing and interesting as you would expect it to be just reading the ingredients. I will definitely be making this again and really soon. Posted in Salad and tagged #citruslove, avocado, avocado salad recipe, citrus recipes, citrus vinaigrette, january, orange blossoms, orange orchards. Bookmark the permalink. Ooops, I forgot to say: this looks like a very delicious salad, can’t wait to try it!! Shockingly for me, I have all of these ingredients in my fridge. This sounds wonderful! Sawsan, This is too funny… I just came in from eating dinner to read my email and what do I see? 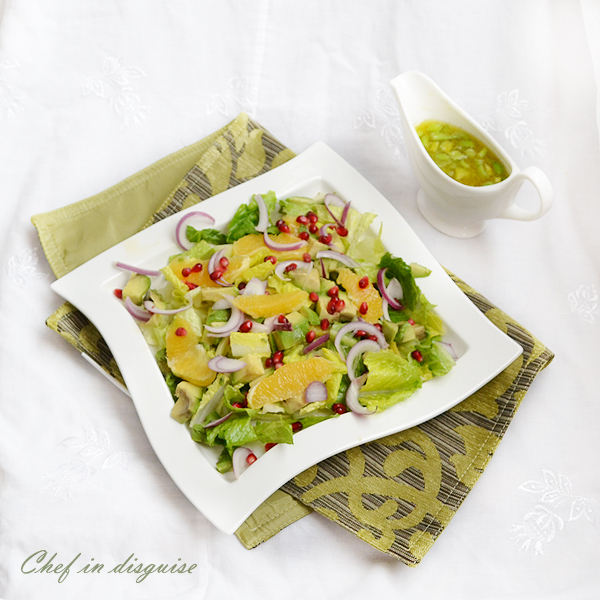 Your Citrus Avocado salad recipe! Can you guess what I had made for dinner tonight? LOL! I must say, that without the recipe, mine was NOT so elegant as yours. I will try this again adding your lovely touches. The red onion and pomegranate, combined with the lovely citrus dressing, will no doubt make even my picky husband like it. Your photography is just beautiful. Great attention to detail. I have booked marked this healthy yummy and seasonal salad. Just to let you know that from an iPad view your censorship completely covers your comment tab. What a lovely post, Sawsan! Your description of mornings at your Grandparents’ home was so rich in detail that I can almost smell the orange blossoms. They surely left an impression upon you for your memories to be so strong. And then you share a brilliantly colored and delicious citrus salad. Well done! Vacations at my grandparents were always extra special, we looked forward to them and they made sure we enjoyed every minute.My grandparents are both gone now and so is that orange orchard, the only thing that is left are the memories. What a gorgeous and healthful salad. I love that you paired the citrus with avocado. I just want to sit with you for lunch today and dine on this beautiful creation! Can’t wait to try the dressing on all sorts of other salads as well. I had the same idea about that dressing, it would be amazing on so many salads. I love the textures at play here too, juicy and a bit crisp with smooth and creamy. Great salad. What wonderful memories of your grandparents home! And what a view to wake up to! I could just imagine the scent from those oranges! I’m so glad you joined in. 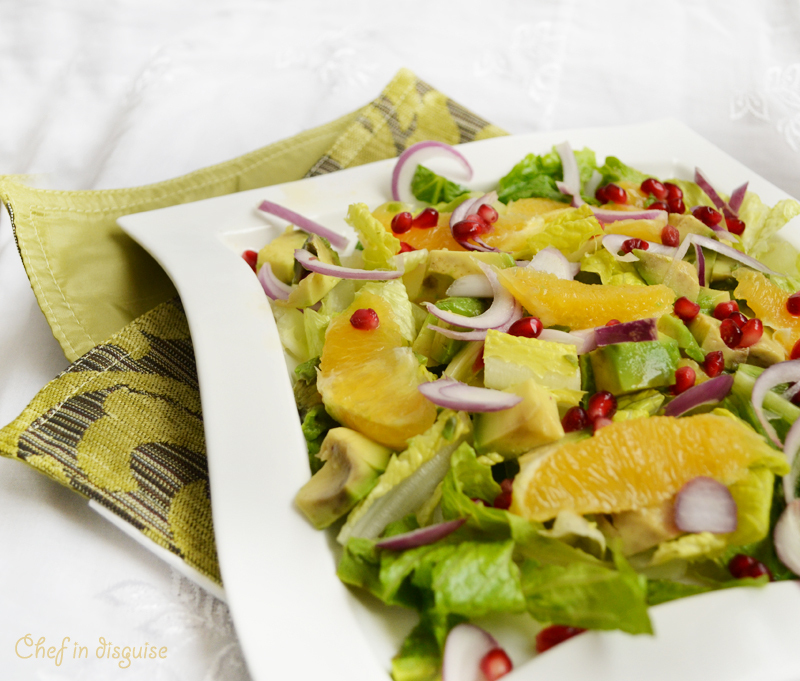 This is a lovely salad, I like the combination of oranges and avocados both for the colorful look and the taste! What a perfect balance of flavors! Lovely post and I could picture what you saw as we have views like that close to home right now. We are in full swing with orange season and Andalucia is also a big avocado grower so this one will be made very soon. Thanks Sawsan! Love it! I’d never have thought about putting avocados with oranges. I’ve actually made a salad with avocados to take to work tomorrow. I’m going to get an orange and try it tomorrow! Will let you know what I think but I’m sure it’s going to be awesome! This looks so great and refreshing! I love simple salads like this! Such a beautiful flavor blend! Th creamyness from the avocado .. the zang and sweet from the orange plus those pomegranate seed! Brilliant salad recipe. My husband’s father grew up among orange orchards too–in southern California! Funny to think of my spouse as a boy, looking out at those orchards, while a world away you were doing the same, and perhaps having the same idyllic dreams . . . .
Avocados and oranges have such affinity that this salad makes perfect sense. The addition of pomegranate takes it right over the top with that splash of additional brilliant color and the sweet-sour flavor that will add to that of the orange in complementing the smooth and earthy mellowness of the avocado. Delicious! The world is a very small place after all Kathryn. I was talking to a friend of mine the other day and we were discussing how sometimes your life line or events parallel those of other poeple you later on meet and it is amazing how much you share even when you have been worlds apart. Where did you get the plate??? I saw something similar in Bed Bath & Beyond the other day. Very pretty, refreshing, and tasty salad here. I think it’s important for salad to look appetizing and you nailed it. I can have a big plate of this salad. I love your citrus dressing as well. I love the idea of this salad and bet all the flavors just blend in perfectly. The perfect blend of the salad… I was with you at play in the trees. It is something how a scent can take you to childhood and back! Chef, this is the closest thing to a perfect winter salad I’ve ever seen! I love all the ingredients (looks like a magical combination!) so I’m really looking forward to making it! Except for the pomegranate seeds I have everything on hand. Thanks! You can totally make this without the pomegranate seeds, I just love the color they add to the salad.